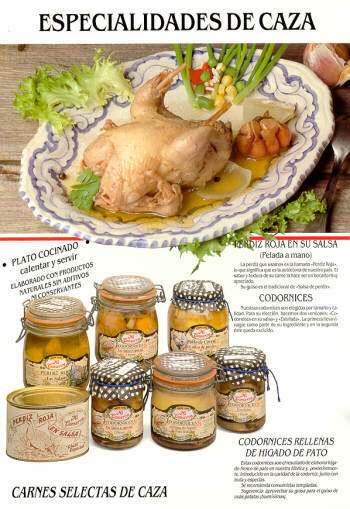 Navarra export catalogue - Precocinados Corella, S.A.
Precocinados Corella S.A. Is situated in Corella, in the heart of Navarre´s market garden. 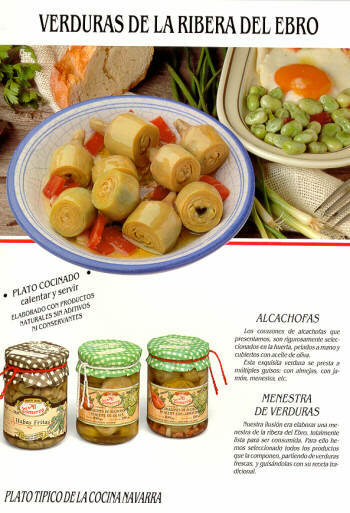 The excellent quality of our canned products is primarily based on the use of firs class agricultural products, piquillo peppers , artichokes, the pochas beans, etc., which are cultivated for us by farmers using traditional and organic farming methods, eliminating the use of additives or preservaties. Our products are therefore consumed by the most demanding palates. Now we are going to give a brief explanation about the elaboration, content and ingredientes of some of our wide range of products. Stuffes peppers: Once we have made the filling, with the best ingredients, we stuff the peppers, and they are canned in their own sauce. Of course, each variety has the most appropiated sauce, depending on their filling. Artichokes in olive oil: They are directly deliverd by the local farmers, and the artichokes are bore in the same day, and bottled by hand in oil with some salt.